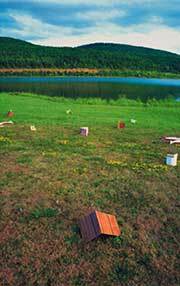 The Residency Program offers self-directed creative time to mediamakers from throughout the country. Since 1971 we have assisted over 1400 artists in the creation of works using new electronic video, sonic and digital technologies. Each year about 40 artists are invited to work in the studio, in a retreat-like workshop environment, which offers access to an image processing system, intensive individualized instruction and time for exploration and personal creative growth. The image processing system is a hybrid tool set, permitting the artist to create interactive relationships between older historically important analog instruments and new digital technologies. 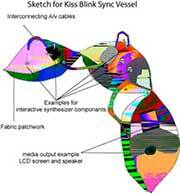 Devices include custom built equipment by David Jones, Dan Sandin, Nam June Paik, and others; new and vintage analog audio and video processors and synthesizers; Max/MSP and Jitter; sonic and control modules by Doepfer; multiple computers; keyers, switchers, colorizers, and cameras; DVD authoring and editing software; and dozens of other tools. All are connected through a sophisticated patch bay. This rich immersive electronic environment encourages artists to explore boundaries and intersections within narrative, documentary and social issue traditions as well as more experimental forms. This year's 56 artists represent 8 states, as well as Israel, Canada, Bulgaria and Norway. About 40% are artists from outside New York State. Applicants in 2004-05 included Mara Alper (NY); Phyllis Baldino (NY); Rene Beekman (Bulgaria); Stephan Belovarich (NY); Kjell Bjorgeengen (Norway); Debora Brown (AZ); Jubal Brown (Canada); Torsten Zena Burns (NY); Pablo Caolpinto (PA); Heather Delaney (NY); Hayley Downs (NY); Monica Duncan (KY); Brendan Ford (MA); Madeleine Gallagher and David Barker (NY); Raymond Ghirardo (Ithaca, NY); Pamela Hawkins (Rochester, NY); Kathy High (Averill Park, NY); Sara Hornbacher (Atlanta, GA); Jitter Working Group (NY and PA); Zohar Kfir (Israel); Annie Langan (KY); Kent Lundberg (MA); Mary Magsamen and Stephen Hillerbrand (NY); Darrin Martin (NY); Brian Milbrand and Courtney Grim (NY); Bianca Bob Miller (NY); Nicedisc (NY); Toban Nichols (CA); John Phillips (Philadelphia, PA); Joe Reinsel (MD); Ron Rocco (NY); Luciana Sanz and Amoeba Technology (NY); Frank Shifreen (NY); Gretchen Skogerson (MA); Jim Supanick (NJ); Julia Tell (NY); Julius Vitali (PA); Ann Sargent Wooster (NY); Roger Wyatt (NY); Jud Yalkut (Dayton, OH); Neil Zusman (Ithaca, NY). Tapes produced at the Center were again included in exhibitions throughout the United States and Europe and on the Web. Recent exhibition venues have included the The Robert Beck Memorial Cinema, Eyebeam, the Museum of Modern Art, The Kitchen, The Tank, Tonic, Art in General, Anthology Film Archives and Art Brutale and in festivals including the New York Film Festival, the Venice Biennale, Dallas Video Festival, Viper (Basel) and the 8th Annual Dumbo Festival. Tapes are distributed by Electronic Arts Intermix, Filmmakers Coop, Drift Distribution, Facets, Microcinema International, Women Make Movies and many others. Artists working at the Center this year have received awards and recognition from State Arts Councils, the National Endowment for the Arts, and private foundations and have received numerous awards and citations in festivals around the world. In keeping with our educational objectives, we hosted the 10th Annual International Summer Workshop, a 10 day intensive residency available for graduate and undergraduate academic credit to 16 media makers. The workshop is co-taught by Pamela Susan Hawkins and Hank Rudolph. Please visit http://www.etcisw.com to see the works which are created during this workshop. We also participate in online salons hosted by NAMAC, empyre and other arts, information and advocacy groups. Through the Media Arts Technical Assistance Program we work with organizations from all regions of New York State to develop the media arts field. We helped organize meetings and other symposia including Strengthening Media Arts in NYS, a NE Regional NAMAC Think Tank and assisted organizations to attend the Deep Focus launch in NYC. The Center serves as a sponsoring organization for artists' projects in the electronic and film arts, providing support services, assistance with development and fiscal and administrative management services. We sponsor about 20 projects each year. Since 2001, with requests totaling over one million dollars, artists have received almost $350,000. Completed projects have received worldwide exhibition and distribution, and have been supported by the National Endowment for the Arts, the NYS Council on the Arts, the McCarthy Foundation, Funding Exchange, the Rockefeller Foundation, ITVS, Astraea Foundation, Soros Documentary Fund, Chase Manhattan and many others. Recent participants include Irit Batsry, winner of the prestigious Bucksbaum Award for Neither There Nor Here, with a world premiere at the International Film Festival, Rotterdam and inclusion in the Whitney Biennial 2002; Alan Berliner for The Sweetest Sound, featured on POV; Abigail Child for By Desire; Slawomir Grunberg for the Emmy-award winning documentary School Prayer: A Community Divided; Barbara Hammer for Culture Doctor, The Female Closet, and her new work Resisting Paradise; Ken Jacobs for NY Ghetto Fishmarket, 1903; and Kristin Lucas for Supervision. Projects have been supported by the New York State Council on the Arts, Funding Exchange, NVR and the Distribution Fund, Creative Capital, New York Foundation for the Arts, The Radcliffe Institute for Advanced Study at Harvard University, the Jerome Foundation, and National Geographic. 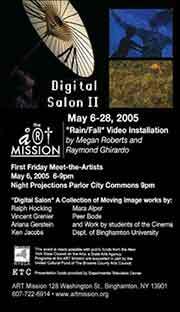 For 2004-05 the following artists have received awards from the New York State Council on the Arts: Irit Batsry for Of Set; Abigail Child for By Desire; Norman Cowie for The Dimension in Which It Reigns Supreme with additional support from the Funding Exchange; Jeffrey Lerer for Manuscript Fragments Found at the Gilbert Hotel; Andrea Stake for The Birthday Party; Caspar Stracke for Cinemacity; Jim Supanick for Seed, Sold Back to the Farmer; Erika Yeomans for Pose-Down. Greta Olafsdottir and Susan Muska received support from the McCarthy Foundation for America is Hard to Find. Other sources of support for sponsored projects currently in production has come from ETC Finishing Funds, Women In Film, Wexner Center for the Arts, Funding Exchange and the McCarthy Foundation. Since 1989 the Film and Electronic Arts Grants Program, has awarded almost one million dollars to individual artists and arts organizations in the State. Finishing Funds 2005 supported 16 electronic media, sonic art and film projects, encompassing web projects, performances, site-specific installations and interactive works. For 16 years, the program has provided $300,000 to New York State artists, to assist with the completion of diverse and innovative projects which challenge the traditional boundaries of the media. This year we had a record number of applicants with requests totaling over $370,000. Finishing Funds is supported in part with public funds from the New York State Council on the Arts and by mediaThe foundation. mediaThe foundation supported 3 special awards for New Media and Intermedia Performance which went to Angie Eng, Tali Hinkis and Kyle Lapidus of LoVid, and Koosil-Ja Hwang. The other Finishing Funds 2005 recipients are Kabir Carter, Abigail Child, Alex Hahn, Eunjung Hwang, Mary Mattingly, Jillian McDonald, Tammy McGovern, Federico Muelas, Laura Parnes, Jennifer Reeves, Jason Van Anden, Jeremy Xido and Adam Zaretsky. This year's awards recognize work which is very diverse, encompassing web projects, animation, acoustic distribution systems, site-specific installations, public art and interactive performances, and includes experimental documentary and narrative, film performance, robotics and the sonic arts. The works approach such diverse issues as the wireless world, the works of Kathy Acker, modular image synthesizing tools, contemporary values, bisexual identity, the Hudson River Park and organic farming. The works in progress have received recognition and support from other organizations including the New York State Council on the Art, Harvard University, Renssalear Polytechnic Institute, Lower Manhattan Cultural Center, Jerome Foundation, Villa Croce Museum, Eyebeam Atelier, The Kitchen, Roulette, Harvestworks, Cultural Spanish Consulate and the Austrian Federal Government. This year's peer review panel was composed of independent media artist and educator Darrin Burns and Buffalo-based new media artist Aaron Miller. The program supported in-person appearances before about 150,000 people, with cable and web audiences conservatively estimated at an additional 150,000. In 2005 we provided assistance to 37 sponsoring organizations in 14 counties across New York State. These organizations contributed almost $700,000 toward these media exhibition projects. This year's recipients included Institute for Electronic Arts at Alfred University, Apexart, Art in General, Art Mission, Bard College, Bowrey Arts and Sciences, Collective Unconscious, Cornell Cinema, Crandall Public Library, Dansology Inc., Diapason Gallery for Sound, Dumbo Arts Center, Evolutionary Girls Club, Filmmakers Cooperative, Fractured Atlas, Hallwalls, Harvestworks, Here Arts Center, Independent Curators, International Film Seminars, Ithaca College, Loisaida Arts, Lower Media Loft, Millennium Film Workshop, Movement Research, New Dance Alliance, Summer School for the Arts, Phoenix Action Network Listen with your Eyes Media Festival, Pratt Institute, Roulette, Saratoga Film Forum, Sephardic House, Squeaky Wheel, Theater for the New City and Visual Studies Workshop. Founded in 1999 The Media Arts Technical Assistance Fund is designed to help non-profit media arts programs in New York State stabilize, strengthen or restructure their media arts organizational capacity, services and activities. The mission is to help organizations to address systemic issues within institutions and within the field. Through direct assistance the program supports organizational and professional development, and the building of critical skills which will assure the vitality and longevity of the organization. Another important component of the Technical Assistance Program encourages the media arts community to convene and discuss issues which have bearing on the field's vitality and longevity. Media Arts Breakfast Meetings and other gatherings Upstate are held on a regular basis to meet and share visions and concerns. This year we convened in Buffalo at CEPA Gallery, in Rochester at the George Eastman House, and in New York City at the Jewish Musem, the Tribeca Film Institute and at Kodak. We are collaborating with American Documentary/POV on Issues of Identity: Mapping the Media Arts in New York State, a multi-focus project which seeks strategies for addressing areas of concern to the media arts. We supported Strengthening the Media Arts in New York State - A Statewide Media Arts Convening and NAMAC Regional Meeting, held in partnership with WAMC and the Electronic Media and Film Program of the New York State Council on the Arts. About 30 media arts and advocacy groups from around the State were invited for one day of discussion surrounding issues of critical interest to the communities, and a second day devoted to one of four NAMAC think tank meetings held across the country each year. In addition to direct support, Technical Assistance helps organizations to attend professional conferences, seminars and festivals including the Association of Moving Image Archivists Annual 2005 Conference, World Social Forum, Alliance for Community Media Conference Waves of Change, 51st Annual 2005 Flaherty Film Seminar Cinema and History, Piling Wreckage Upon Wreckage, American Institute for Conservation of Historic and Artistic Works 2005 conference, and NAMAC's Deep Focus launch at the Smithsonian in New York City. This year's total request to Technical Assistance was about $ 90,000. The program provided about $ 52,000 in support of requests from 43 organizations in 11 counties including the Anthology Film Archive, ArteEast, Association of Independent Video and Filmmakers, CEPA, Children's Media Project, DYKE TV, Electronic Arts Intermix, Fales Library at NYU, Filmmakers Cooperative, Franklin Furnace, free103point9, George Eastman House, Ghetto Film School, Global Action Project, Hallwalls, Harvestworks, Independent Media Arts Preservation, Ithaca College, Broadcast Archive and Media of the Jewish Museum, Kibo Projects, Kirkland Art Center, New Media Alliance, Paper Tiger TV, Rhizome, Renssalear Polytechnic Institute, Saratoga Film Forum, Squeaky Wheel, Syracuse University, Tribeca Film Institute, Visual Studies Workshop. 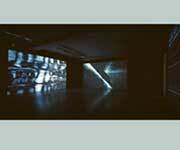 The Center is committed to the early history of media art and its preservation. Housed at the Center is a collection of over 1000 videotapes which chronicle work produced here over the last 30 years. We are a founding member of Independent Media Arts Preservation. We are past participants of the Regional Cataloging Initiative and the National Moving Image Database project of the American Film Institute, and will participate in the Pilot Union Catalog project in NYS. The goals of the Video History Project are: To provide a dynamic vehicle for the creation and dissemination of an inclusive media history, crafted by those who are shaping it; To further the critical discourse among scholars and historians engaged with the study of the origins of media art; To contribute to the continued enrichment of knowledge within the media arts community globally; To capture the cultural environment, technological visions of individuals, and the modes of institutional support present during the early developmental years of media; To document and interrelate information about individuals, organizations, instruments, creative artworks, and events;To raise cultural awareness of the origins of media art;To increase public awareness of and appreciation for media history throughout the State and internationally. Goals are realized in an interrelated set of activities combining research and scholarship, through the enrichment of History Web content, and as collaborative projects supporting issues in electronic moving image preservation through the hosting of conferences and seminars. The first conference, Video History: Making Connections, (1998) brought together over 250 pioneering practitioners and contemporary artists working in new media and interactive technologies. In June 2002, the Center invited over 60 media arts professionals, conservators, technical experts, and artists to gather at the historic firehouse home of Downtown Community TV Center in New York for Loing Back/Loing Forward, a two-day working symposium on moving image preservation. The symposium was organized by the Experimental Television Center, in association with Independent Media Arts Preservation (IMAP) and Bay Area Video Coalition. Focused on the physical preservation of independent electronic media works and related issues concerning tools and ephemera, Loing Back/Loing Forward facilitated an honest and sometimes disturbing evaluation of our progress as a field and informed discussion about necessary and realistic initiatives and partnerships. The edited proceedings and reports are posted on the Experimental Television Center's Video History site. 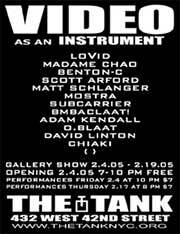 Loing Back/Loing Forward was also documented on videotape by Bay Area Video Coalition. In 2003 we produced a CD Early Media Instruments featuring a database of significant imaging devices which played a critical role in the historical development of independent media art. The database contains photographs of the devices, examples of product literature, as well as texts and manuscripts describing the tools. The devices include video, audio and computer-based tools, both commercially available and designed by artists and engineers. The CD was featured in a three month long exhibition "Origins" at ArtsInteractive Gallery, curated by Mary Ann Kearns for the Cyberfest in Boston, along with representative tools from the era of the early 1970s. The focus since 2000 has been on the continued enrichment of content on the Video History Web and the development and implementation of collaborative strategies for advancement of electronic moving image preservation resources and tools. Formally launched in 2000, the Video History Web functions as a both a dynamic and interactive on-going research collection and dissemination vehicle for media professionals, educators, and media programmers as well as the general public. Resources include critical essays, manuscripts, interviews, biographies, an extensive bibliography with over 2500 entries and information on collections, distribution, tools, preservation, organizations, and individuals. In the Chronology area visitors can generate a timeline of events in media arts history, or view the events within a defined range. Visitors are encouraged to contributed information to those areas which provide access to historically significant texts concerning the evolution of media art and community television. We also target resources, gaining permission before materials are electronically published. Information is uploaded to the site on a regular basis. The fully searchable site structure serves information contained in 12 databases holding over 6000 records. Results are reported topically, organized by resource area. The search function allows visitors to search all of the records, encouraging the visitor to discover broad interconnections among people, places and events. The site had over 1.5 million accesses in 2004. Over 28 billion bytes of history information was provided, 4 billion in the first 12 weeks of 2005 alone. The site last year had over 6 million hits. The site is visited by thousands of people every year. It is a resource used by researchers, historians, artists, archives and video enthusiasts. We routinely respond to queries from researchers, scholars, educators and home enthusiast. The site has been an important tool for a range of activities - including original research for writing of bos, catalogs and monographs; a method for locating primary source materials; a way for people to locate others they have lost contact with over the years; a source for preservation information of tapes created with obsolete equipment. In 2004-2005 the Daniel Langlois Foundation for the Arts is assisting with the continued development of the Video History Website. The Foundation supported eight organizations that are encouraging the meeting of art and science in the field of technologies, as part of its new Strategic Grants for Organizations. The Foundation received 168 submissions in response to its call for proposals within this program, of which eight were selected: four from Canada, two from the United States, one from India and one from Peru. With the assistance of the Langlois Foundation, as well as of the New York State Council on the Arts, we are focused presently on early video/media instruments - those tools designed individually or by artists and technologists working collaboratively, as well as innovative commercial devices. This research links associated texts, documentation, technical data, maker biographies and interviews, and tapes produced on these systems. Content derives from our tool and paper archives. We are electronically photographing the devices, and in some cases, creating moving image records of the functioning of the tool. We are scanning associated texts, documentation, and ephemera related to events which include posters, exhibition program notes, exhibition catalogs; and audio and video interviews. The data would be published on the existing History Project Website; we are exploring other modes of distribution of the information as well. These include a DVD publication, and a companion text, published in association with Felix: A Journal of Media Art and Communication to be co-edited by Kathy High, along with Sherry Miller Hocking and independent researcher Mona Jimenez. We intend to draw into the discussion new makers who have a relationship with analog devices either as part of their art practice or as an essential element of their conceptual base, and new media artists whose conceptual approaches are similar to those of early media practitioners. 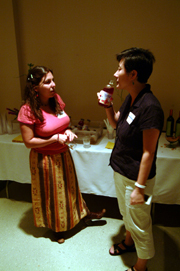 A Festival is planned for 2006 to focus on the research, and bring historical and new works to arts audiences. In this way we see the project as a bridge between "old" and "new" media, in the same way that the History Conference was conceived. The National Television and Video Preservation Foundation provided in-kind support in 2004-05 to preserve and remaster 10 hours of very early videotapes from the Center's collection; the works were produced in the 1970s and showcase early analog and digital video imaging tools. The project focused on those instruments - tools individually designed by artists and the collaboration of artists and engineers/technologists, modifications to existing technology, and innovative applications of commercial technology - and the collaborative relationships between artists and engineers, and the interdisciplinary nature of early media arts practice. The tapes which we are seeking to preserve feature important early video devices designed in the early to mid 1970s, including those created by Nam June Paik (wobbulator or scan processor, and the construction of the Paik/Abe Video Synthesizer and its use with the TV Bed, exhibited at the Everson Museum in 1972), David Jones, Bill Hearn, Steve Rutt and Bill Etra, Dr. Don McArthur, the Vasulkas and Dan Sandin. We have informational materials, technical information, ephemera including early posters and programs, and photographs related to the tools. We received an Artist in Residence Award from the Institute for Electronic Arts (2005) for the creation of series of DVDs which document the operation of artists' designed instruments, including the the Paik/Abe Video Synthesizer, Paik Raster Manipulation Unit, Rutt/Etra, Sandin Image Processor, Jones Colorizer, Frame Buffer, Keyer and Sequencer. Other contributors have included The National Television and Video Preservation Foundation, The Andy Warhol Foundation for the Visual Arts, Statewide Challenge Grant Program, Media Alliance, Institute for Electronic Arts at Alfred University. Partners: the Institute for Electronic Arts, Independent Media Arts Preservation, Bay Area Video Coalition, Everson Museum of Art, Critical Artware. The Center's programs are supported by the Electronic Media and Film Program at the New York State Council on the Arts; Daniel Langlois Foundation for Art, Science, and Technology; the Media Arts Program of the National Endowment for the Arts; mediaThe foundation; NYS Challenge Grant Program; The Andy Warhol Foundation for the Visual Arts; the New York Foundation for the Arts; the Media Action Grant Program of Media Alliance; by the Institute for Electronic Arts at Alfred University, the Everson Museum of Art, IMAP, BAVC, VidiPax; and by corporate support from Dave Jones Design and Black Hammer Productions and by the contributions of many individual artists.